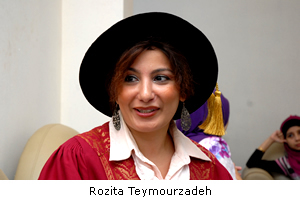 Iranian Rozita Teymourzadeh, the daughter of a dentist, chose Malaysia to further her studies in electronics and nano technology because of the climate and environment . The Malaysian hospitality had also attracted her to stay in the country where she lived for the past nine years. Armed with a degree from Iran she first went to Sweden but found the climate there too cold. That brought her to UKM to further her studies until being conferred her doctorate today. She now lectures at UCSI University Cheras and has bought a condominium there. She considers Malaysia her second home and her family would travel to Malaysia on a regular basis. Her experience in UKM is a very pleasant one and she finds the academic staff very helpful. She feels that UKM has played a strong part in shaping her view of Malaysia and she hopes she could give something back to the community.